When the Galactic Empire begins construction on a massive super-weapon known as the Death Star, it's up to these spirited, determined heroes of the Rebel Alliance to save the galaxy from catastrophic ruin. Rogue One: A Star Wars Story, in theaters this Friday, follows the brave souls who risk their lives in an attempt to steal the plans to the Death Star. These heroes come from all backgrounds and corners of the galaxy: Some have fought in the Clone Wars, others have a deep belief in the power of the Force, and some even have blood ties to the Death Star itself. Here are the heroes of Rogue One: A Star Wars Story. Erso is a soldier and one of the key figures in the Rebel Alliance's attempt to steal the Death Star plans. Bold, brash and never afraid to speak her mind, Erso has a unique connection to the Death Star, as her estranged father Galen Erso played a major role in bringing the Death Star to life. Despite her troubles with authority, Erso is a natural leader and inspires hope within her comrades. Andor is a respected figure among the rebels, earning a strong reputation for his service as an Alliance Intelligence officer. Members of the Rebellion look up to Andor and his ability to inspire soldiers and remain level-headed in the thick of battle. Because of Jyn Erso's history of risky behavior, Andor was assigned to keep watch over her during the mission. Pronounced Kay-Tuesso, this droid once served the empire but was reprogrammed by Andor to serve the rebel cause. Because of his past affiliation with the empire, K-2SO can blend in seamlessly at Imperial locations, making him of great value to the Rebel Alliance. Although he is not Force-sensitive himself, Imwe is a deeply spiritual warrior monk who believes that every living thing is connected through the Force. Imwe is blind but through rigorous physical and mental training has been able to craft himself into a powerful fighter. While Imwe is spiritual, his comrade and close confidante Baze Malbus is much more of a realist, having witnessed the first-hand horror of his home being occupied by the Empire. But just like Imwe, Malbus is a talented at combat, expertly-skilled at his heavy repeater cannon. 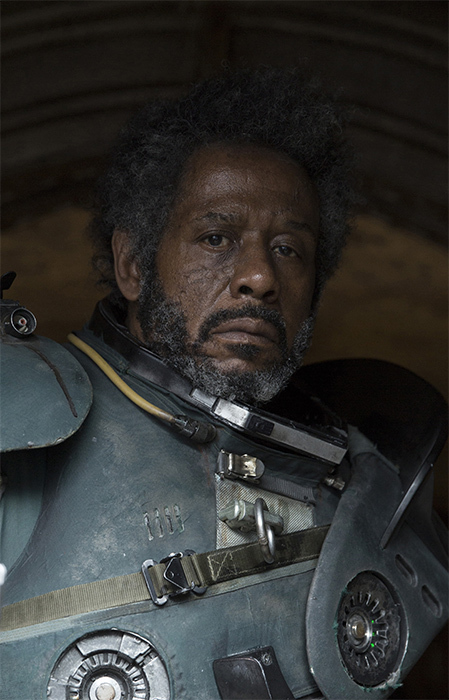 Gerrera has seen more than his fair share of combat over the years, having fought in the Clone Wars and now leading a band of Rebel extremists. Now in ailing health, Gerrera is still determined to give it his all in the fight against the empire. Rook isn't as experienced in battle as other rebels when it comes to combat, but his expert piloting skills make him a welcome addition to the team. Mothma helped establish the Rebel Alliance and recruited Erso to the cause. Mothma is the alliance's civilian leader, and helps guide the rebellion to success. Watch Rogue One: A Star Wars Story when it hits theaters on December 16, 2016. Get your tickets now for the movie at Fandango, MovieTickets.com and Atom Tickets.